Lay Servant Ministries is a program within the United Methodist Church designed to equip and empower laity to be engaged in disciple-making. The program focuses on the areas of Leading, Caring, and Communicating: these words characterize what lay servants do in ministry as The United Methodist Church engages the world of the twenty-first century! If you are interested in taking your discipleship to the next level, becoming involved with the Lay Servant Ministries program would be an excellent way to get started. 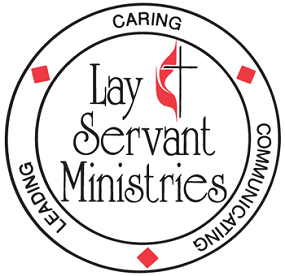 If you have general questions about the Lay Servant Ministry program, you may speak with Pastor Denise or Guy Raymond. Spring 2019 Basic and Advanced Lay Servant classes for certification and re-certification are now available. For more information on dates, times and registration click here for Basic and here for Advanced. Dates are available in all districts. The annual Advanced Lay Servant Report must be completed ONLINE only, per the Conference office. You should receive an email from the Conference office with this information along with a user name and password in time for the October reporting. Remember that submitting a form to your annual church conference is necessary (per the Book of Discipline) to maintain your lay servant status. You will need to print a copy of the form to submit to your church. Be sure to make a copy for your records.